The problem with boffo product demos is that people might take you seriously. And they might do it long before you’re sure it’s a product people need or want. Then some of the auto¬motive companies already installing Sirius Radio hardware as optional equipment saw the demos and pushed the company to get the product into production. On the face of it, adding video to audio offerings doesn’t seem like a bad idea. Today, 29 percent of the 115 million households in the United States subscribe to satellite TV, according to the Consumer Electronics Association, in Arlington, Va. That’s a tempting market. Turning a technology demonstration into a commercial product isn’t always easy. In this case, the first hurdle was to develop a new modulation scheme. For the demo, Sirius had temporarily taken several radio channels off the air and given the TV broadcast all the bandwidth it needed. But a commercial product would have to fit into the Sirius network without cannibalizing the radio channels quite so gluttonously, and without making it impossible for existing satellite radio units to continue to receive the company’s audio programming. The engineers of Sirius’s Advanced Development Team in Lawrenceville, N.J., got to work. Enthusiastic about the product, the company announced in January 2005 that it would launch Sirius TV in 2006. That didn’t happen. “The PR got out in front of our technology a little bit,” Smith says. But the engineers really rose to the occasion. They developed an impressive new transmission technology that breaks up the video signal and combines chunks of it with each of the more than 130 radio channels that fill Sirius’s allocated 12.5 megahertz of spectrum. Existing radio receivers screen out that signal as noise, but the new TV receivers recognize the signal as data and decode it. This is an implementation of a transmission technique called hierarchical modulation, in which two streams of data are sent at a given frequency; one is given a high ¬priority—in this case, the radio ¬programming—the other, the pieces of video data, are assigned a lower priority. Sirius’s new signal carries enough data for three TV channels at a resolution that looks fine on an 8-inch-diagonal screen. (Sirius won’t say what the exact resolution is.) And it has some bandwidth left over for additional applications that have yet to be determined but may include data services. To squeeze the video into a package small enough to be transmitted on top of the radio channels without affecting their reception, Sirius engineers chose the H.264 standard for video compression but tweaked it—exactly how they changed it is proprietary. H.264 was the obvious choice. It’s part of the MPEG-4 suite of standards, it’s in blue-laser DVD systems, and it’s used in Norway for digital TV broadcasts. A host of other countries are including the standard in their digital broadcast plans. The engineers also beefed up Sirius’s existing error-correction software to reduce dropouts and designed the system to use two antennas—one attached to the front of the vehicle and the other to the rear—to improve the system’s chances of picking up the satellite signal. The team also developed a chip that implements this technology, which is being fabricated by STMicroelectronics, headquartered in Geneva. The Delphi Electronics and Safety Division of Delphi Corp., in Troy, Mich., designed and manufactures the receiver hardware. Sirius signed agreements to rebroadcast the programming of three child-oriented TV channels—Cartoon Network, Disney Channel, and Nickelodeon. The service, now called Backseat TV, launched late last year. It debuts in 2008 Chrysler Town & Country and Dodge Grand Caravan minivans (with more car models in the pipeline) and is sold through electronics retailers as an aftermarket add-on. 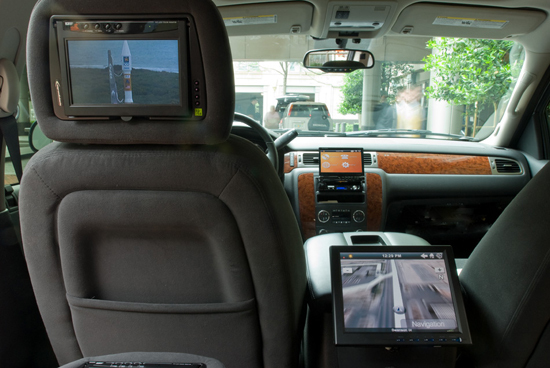 A Backseat TV add-on to Chrysler’s rear-seat entertainment system costs US $470; the whole package, including two DVD players, two 8-inch video screens, a rear backup camera, and a one-year subscription to Sirius Radio and TV, costs $2020 for high-end models of the minivans (in which some features are already standard), more for less expensive models. In retail stores, a Sirius Backseat TV receiver, without a subscription, lists at $300. The subscription price is $7 per month, added to the $12.95 Sirius Radio subscription; you can’t get a Backseat TV subscription by itself. The initial customer response seems positive, if mildly so. Mike Kane, Chrysler’s director of advanced technology strategy, says that 20 percent of the Town & Country minivans now rolling off the assembly line have Backseat TV installed; for comparison, about 35 percent of buyers have purchased the DVD-only entertainment system in the past. But for soccer moms, the product’s main audience, Backseat TV ain’t the only game in town. And Backseat TV doesn’t appear to be the game soccer moms want to play. In fact, some seem downright hostile. “If it were free and came standard, I’d pay to have it taken out!” huffs Catherine McNiel, a mom in Glendale Heights, Ill. Adds Alma Klein, a mother and advertising executive in Oak Park, Ill.: “I can only imagine how annoying it would be to pull into the supermarket parking lot only to hear, ‘No, don’t turn the car off, my program’s still on! Industry observers acknowledge that with so many ways to get video in the car—portable game consoles, iPods, laptops, and some cellphones, in addition to DVDs—consumers are not going to be clamoring for this product. Thilo Koslowski, lead automotive analyst and a vice president with Stamford, Conn.–based Gartner, does not see Backseat TV as a compelling product in a world with many on-demand video options. But Koslowski commends Sirius for innovating, because innovation in satellite radio has been a pretty rare commodity for a while. He says, it would have been a really bad idea for the company to pull the plug on the project after talking about it for so long. And Sirius did prove that, indeed, even far-out demos can come true. Mobile TV is shaping up to be a big story at this year’s Consumer Electronics Show, with three different systems slugging it out the way cable, satellite and broadcast TV all vie for couch-potatoes’ viewing time. First out of the gate is ICO mim, a satellite-based service initially for cars. Their G1 satellite launched in April, and they’re running their first truly live demo at CES this year. The satellite covers the whole U.S., but mim will roll out city by city as ICO installs ground-based repeaters to make sure drivers get signal even where they can’t see the sky, said Chris Doherty, a spokesperson for ICO Global Communications. “Terrestrial repeaters in urban areas allow signals to get to places where satellite signals tend to be challenged,” Doherty said. ICO is running trials in Las Vegas and in Raleigh, N.C., to figure out how to physically design a nationwide rollout, he said. ICO mim uses Alcatel-Lucent equipment running DVB-SH, an international standard that’s had several trials, but no commercial launches yet. The company is planning to initially deliver 10 to 15 channels of live video, plus navigation information, weather data and an OnStar-like emergency assistance service, Doherty said. Video programming will come from NBC Universal, Turner, MTV and Viacom, he said. All of this will cost $15-25/month. “We think we’re in the right pricing range, and by offering value-added navigation and the emergency communications capability, that makes it a good bundled value,” Doherty said. The DVB-SH link is two-way, letting cars communicate back to the satellite. That allows drivers to not only get help in remote areas where OnStar doesn’t work (as OnStar uses Verizon Wireless’s cellular network), but will let the mim system send down real-time traffic updates and an interactive TV program guide, Doherty said. Initially, mim will only be available in cars. ICO’s CES demo will feature seat-back TVs from Delphi and an unusual front-seat screen that shows navigation information to the driver, but TV content to the passenger. ICO is also demoing a quasi-handheld unit from Archos, designed for rental cars, which plugs into a car’s cigarette lighter. The market for watching long-form TV in the U.S. right now is in cars, not on phones, said Avedis Menechian, chief technical officer and chief marketing officer of Alcatel-Lucent Services. But that will change, he said, and when it does, ICO mim will move onto handhelds. South Korea has had satellite TV phones for a few years now, using the S-DMB system. “As the market expands and grows, the shift from vehicular to handheld or laptop mobile devices will go with the stream. Our focus is threefold,” in cars, handhelds and PCs, he said. Later at CES, we expect to hear from the Open Mobile Video Coalition, which has a system for local TV broadcasters to aim signals at cars and phones, and we expect to hear the formerly phone-bound Qualcomm MediaFLO (think of them as basic cable) branching out into cars. We’ll run more comparative coverage of all three systems – and the devices that run them – throughout the show. Previous Previous post: I live in Latvia – unfit prime minister. Next Next post: Boeing 737-800 Crashes In Amsterdam.